Gopal Guru, "Taking Indian Nationalism Seriously"
Lawrence Liang, "A Gadfly: The Jurisprudence of Dissent"
Romila Thapar, "The Past as Seen in Ideologies Claiming to be Nationalist"
Prabhat Patnaik, "Two Concepts of Nationalism"
“Yesterday, I saw in the papers that Arun Jaitley has accused Rahul Gandhi of betraying his father, grandmother and great-grandfather, saying that while they had stood for nationalism, Rahul Gandhi was hobnobbing with the ‘anti-nationals’ of JNU. The real point, however, is that the ‘nationalism’ Nehru had talked about and the ‘nationalism’ in terms of which those with whom Rahul Gandhi is hobnobbing are considered ‘anti-national’, are not identical terms. “In other words, there is a deception whereby the concept of nationalism as an inclusive, egalitarian, democratic concept is substituted by an aggrandizing nationalism; and the moral high ground that the former has historically occupied in the eyes of the people is then sought to be appropriated by the latter. 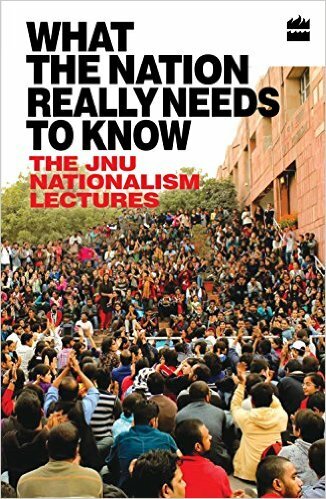 The claim is that the nationalism the government stands for is the same as what Gandhi had stood for, but that the JNU students stand for something altogether different. “This attempt at destruction of thought is a very serious phenomenon and it is not surprising that the most outstanding institutions in the country, whether it is the Film and Television Institute of India, or he fine arts department of M.S. University, Baroda, or JNU, or the Hyderabad Central University, or the Jadavpur University, are the ones currently under attack. “There is another feature of these institutions that I would like to draw your attention to, namely that they are all publicly funded institutions. You don’t find any opposition arising in private universities or private institutions. I’m not blaming the students of private universities or institutions, but because they are constrained willy-nilly to get commoditized, a process of destruction of thought which necessarily comes with the commoditization of education, has already become institutionalized there. It is the few places which, because of their character of being publicly funded, have avoided getting commoditized until now, and which therefore still constitute sites of critique, of discussion, and of intellectual vibrancy and excellence, that are now being targeted. Satyajit Rath, "विविधता और एकता के जैववैज्ञानिक पहलू"
“Take the cells in your body. In the first place every one of your cells has a somewhat different genome sequence. लेकिन वो छोड दीजिएगा| There are cells in your body which do not have your entire genetic complement. And these are the cells in your body, for example, that make antibodies. Everybody has heard of antibodies, so let us not worry about what they are and so on and so forth, everybody has heard of antibodies; वैक्सिन्स दिए जाते हैं, एंटीबॉडीज़ बनती हैं, प्रोटेक्शन करती हैं, वगैरह, वगैरह, वगैरह। Now, if you take the cells that make antibodies, every one of those cells individually — we’re talking about billions of cells — every one of those cells is different from every other cell. The diversity of your antibody repertoire is immense. We’re talking about diversity in the millions. Right? Here is an example of diversity in your body, of your own cells. So you turn around and ask the same question — is this diversity simply being ‘tolerated’, या इस का कोई मतलब भी है? And repeatedly over the past fifteen years — and I will stop here because I am now referring to relatively recent biological science in the making — over the past fifteen years it has steadily become more and more apparent that, as we restrict the antibody repertoire, so do we limit the ability of the body to make effective immune responses against microbial diseases. There is positive value in diversity even in biological systems.